A current exhibit at the Craft & Folk Art Museum. Come join fellow Assemblers out for a museum visit and lunch at the Craft & Folk Art Museum on Miracle Mile! Now celebrating its 50th year, this museum offers consistently unexpected exhibitions of compelling work that takes traditional techniques in new, often surprising directions. Exploring the leading edge of craft, art and design, the Craft & Folk Art Museum gives audience to diverse makers and artists whose work is often not represented in larger art institutions. 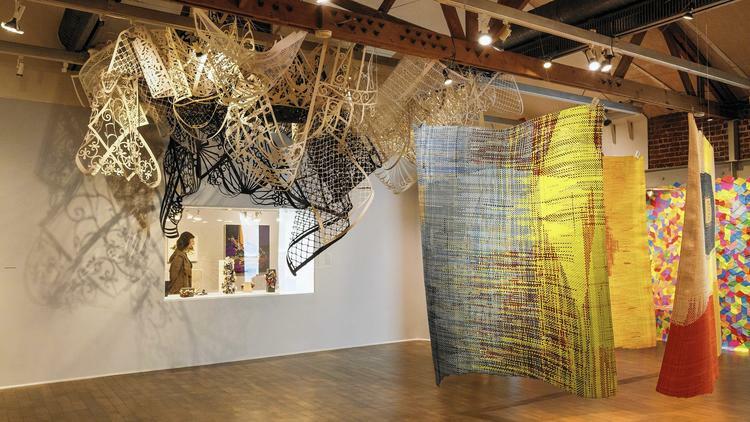 For an in-depth description of their current exhibits, read "On Craft & Folk Art Museum's golden anniversary, 'Paperworks' is a cutting-edge gift" from the LA Times. We'll meet outside the entrance and socialize for a bit before exploring the museum exhibits. Afterwards, we'll go out for lunch at one of the many eateries within walking distance. General admission is normally $7 for adults and $5 for seniors and older students, but Sunday admissions are "Pay What You Want" - let your conscience be your guide. $5 validated parking available at 5750 Courtyard Place, Los Angeles, CA 90036. See you there! Join me and other Sunday Assembly LA folks today at Noon: Craft & Folk Art Museum on Miracle Mile! Tomorrow at noon: Join Sunday Assembly LA for our Sunday Social: Craft & Folk Art Museum on Miracle Mile! Note: Although I was set to host the meetup, I unfortunately can’t go because my young son is sick. You’ll instead be greeted by our official Tornado of Fun, Gina Kirkland! Please have fun and I hope to see you at the next Sunday Assembly Sunday Social.